1. 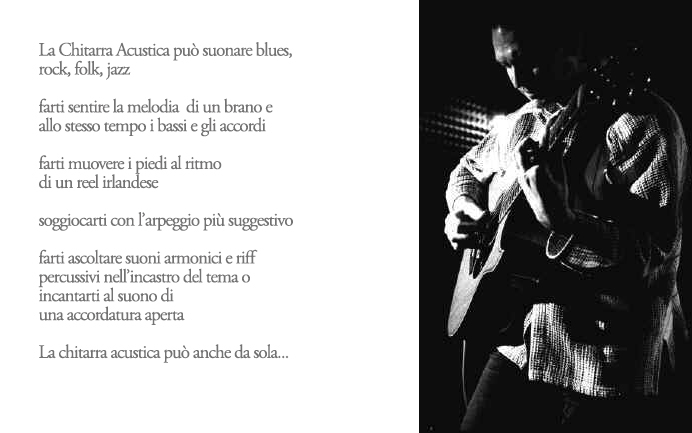 Stili tradizionali: fingerpicking, arpeggi classici, forme di accompagnamento del cantato, linguaggio blues. 2. Stile moderno: arrangiamento per sola chitarra, fingerstyle e walking bass, tecniche percussive e tapping, improvvisazione per sola chitarra acustica, la chitarra acustica in ensemble dal duo al quartetto. 3. Amplificare la chitarra acustica. I Workshop e le Master Class prevedono brani, esercizi ed esempi basati su dispense e pubblicazioni didattiche (vedi più avanti). Giovanni Palombo si occupa di didattica da molti anni. Egli illustra tecniche e stili con tutta la versatilità che la frequentazione di ambiti musicali diversi, come solista, e in gruppo, permette. Come uno dei maggiori esperti italiani di chitarra acustica contemporanea, ha sviluppato nel proprio modo di suonare uno stile personale che non dimentica la tradizione ma la evolve con la conoscenza e l’approfondimento della moderna armonia e della improvvisazione. Nella sua tecnica sono inoltre presenti quegli elementi di stile percussivo e di tapping che fanno del suo un chitarrismo a tutto campo, ricco di sfumature. Le sue Master Class e i suoi Workshop (Fingerstyle, Unplugged, World Music, Guitar Harmony), sono tenuti presso diverse strutture musicali, e sono apprezzati anche presso Conservatori di Musica e Festival (Conservatorio di Frosinone, International Meeting of Acoustic Guitar, Sarzana, Conservatorio di Dresda(Germany,2006), Soave Festival Internazionale di chitarra, Rieti Guitar Festival, Fiuggi Guitar Internazional Festival, LaPalma-Roma Jazzità Intensive W/Shop). Ha collaborato per molti anni con rubriche e trascrizioni alla rivista "Chitarre". Endorser ufficiale delle chitarre acustiche Lakewood e degli amplificatori SR, ha pubblicato a suo nome oltre 10 CDs (vedi discografia). “I first met Giovanni Palombo many years ago when he came as a student to the Berklee Umbria Jazz clinics. He was already a solid guitarist who like all of us was searching for his own voice. We met many times after that as friends. Giovanni quickly discovered his love of the acoustic guitar and it's many possibilities long before it was in fashion. He is an excellent writer and has organized some very interesting groups to perform his writing. I'm sure any guitarist interested in exploring the many possibilities of the acoustic guitar would benefit greatly from this book. Congratulations Giovanni"
Languages for the Modern Acoustic Guitar. Elements of Guitar Harmony, Arranging for Solo Guitar. A bland of Blues, Folk, Classic and Jazz. 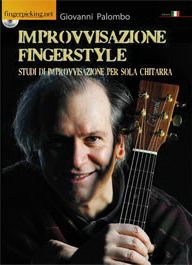 For basic, intermedie and avanced fingerstyle guitar. Giovanni’s Owner Manual (Notebook on Exercises & Exemples). ACOUSTIC SHAPES is a collection of original compositions. As melodic and harmonic pictures they show us the many different possibility offers by the acoustic guitar. You can find a deep lyricism in Omaggio ad Astor (Hommage to Astor) and La Profezia dell'Armeno (The Armenian Profecy), blues phrasyng and ostinato walkin' bass in Mr. Kelly. Ralphando (a dedication to Ralph Towner) has jazz shadows, 'Maggio Bevuto 'o Suonno has a popular and melodic taste. A Briglie Sciolte is played with tapping and percussive technique, while La Notte che Inventarono il Rock'n'Roll has a more rock flavour. L'Attesa flows with a subtle latin nuance. The Fingerstyle Guitar lead us to paint emotions through the creativity, always changing models and forms: the Acoustic Shapes. "I first met Giovanni Palombo many years ago when he came as a student to the Berklee Umbria Jazz clinics. He was already a solid guitarist who like all of us was searching for his own voice. We met many times after that as friends. Giovanni quickly discovered his love of the acoustic guitar and it's many possibilities long before it was in fashion. He is an excellent writer and has organized some very interesting groups to perform his writing. I'm sure any guitarist interested in exploring the many possibilities of the acoustic guitar would benefit greatly from this book. Congratulations Giovanni" Jim Kelly (performer artist and guitar teacher at Berklee School of Music, Boston U.S.A.) “Giovanni Palombo’s musical microcosm is characterized by an original amalgamation of mediterranean melodic phrases, impressionistic harmonic progressions and jazzy improvvisations. His compositions moves within that especially staked out area with a serene, broad swing, majestic, impelling, playful, always with a surprising twist” (Acoustic Music Records).